Kennebec Journal Editor’s note: This is part of a series of weekly columns written by residents commemorating the 250th anniversary of Hallowell. The Hallowell Granite Works cut granite for buildings, paving blocks, monuments and statuary. Building materials and paving blocks could be cut by general laborers, but monuments and statuary required skilled cutters. Many of these cutters came from Italy in the 1870s and ’80s. Thus, the era of Italian immigration in Hallowell. 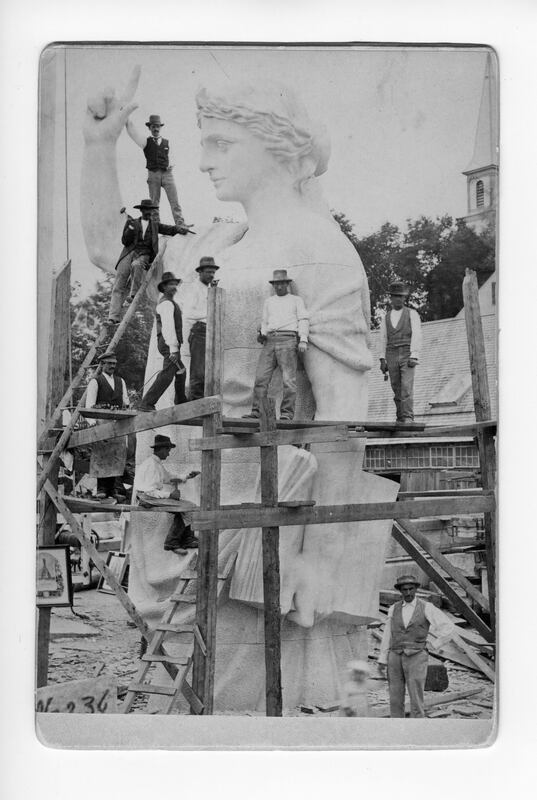 Protasio Neri, a skilled statuary cutter, arrived in Hallowell in 1879. He was born in Levigliani, Italy, and learned his trade at the marble works in Carrara. Other workers followed and a small Italian neighborhood grew around the Neri home on Warren Street. They sent their children to the Warren Street School or nearby Bodwell School on Middle Street and the children gradually became assimilated into Hallowell life. Protasio Neri is credited with carving the bas-relief and one or more of the figures on the impressive Plymouth Pilgrim Monument. Neri was not just busy in the carving shed. He became a labor leader and was heavily involved in the Granite Cutters Union during a 5 1/2-month lockout at the granite works in 1892. He wrote lengthy letters in Italian to the Granite Cutters Journal and generally looked out for the rights and interests of industry workers. Another outstanding artisan was Archille Falconi. He had a special talent for first modeling in clay the figures that he would later carve from granite. In 1887, The Hallowell Register reported that Falconi had completed his model of the fruit pieces that he would later carve for placement above the doorway at the main entrance of the Metropolitan Museum of Art in New York City. Between 1880 and 1900 many other families joined the original settlers. Arata, Carmoli, Bettucci, Galizia, Galli, Masciardri, Perazzi, Pellegrini and Preti families came during this period and many of these names are still found in the community today. Settimo Masciardri began to work for the Granite Works in the early 1890s. Settimo and Charles Perazzi later opened the Kennebec Monument Works, and in the 1930s Settimo established S. Masciardri and Sons on lower Water Street, specializing in gravestones and monuments. His son, Americo, continued the business until his death in 1981. Today it is owned and operated by grandson Tony. Another of Settimo’s sons, Alfredo, opened a popular Water Street store known as Fido’s Filing Station, which was a community fixture for decades. In the early 1900s, modern building methods using steel and concrete were introduced and the need for granite as a structural material declined. As a result, the Hallowell Granite Works needed fewer workers. Some, like the Masciardris, found ways to use their skills locally, but many of the stonecutters moved their families elsewhere to find work. However, their grandchildren and great-grandchildren are now curious about the time their ancestors spent in Hallowell and make requests at City Hall and Hubbard Free Library for information on their families. The information swap is often reciprocal. A descendant of the Preti family provided a memoir written by her grandmother detailing adventures and life lessons learned while living as a child in Hallowell in the early 1900s. She closed her memoir by saying the years she spent in Hallowell were some of the happiest of her life. Wanted! Your nominations for Citizen of the Year!